About ninety percent of countries have declared a language in particular their official one; some have declared several. Since thereafter people have to know the official language(s) of their countries so as to communicate with their governments or listen to the main TV channels, these official declarations aren’t trivial; they very much influence the populations concerned as well as the survival of the other, non-official, languages spoken in the country. In order to save a language, such as a regional one for example, it is in fact with incisive – and oftentimes decisive – effort that a group of persons has to defend its cultural heritage. It is estimated that by the year two thousand one hundred, about 2,500 languages other than your own will still exist; that is, about two thousand five hundred and one languages full of scientific, medicinal or futile knowledge, two thousand five hundred and one languages full of the cultural traits every past generation has so far conveyed to the next ones. 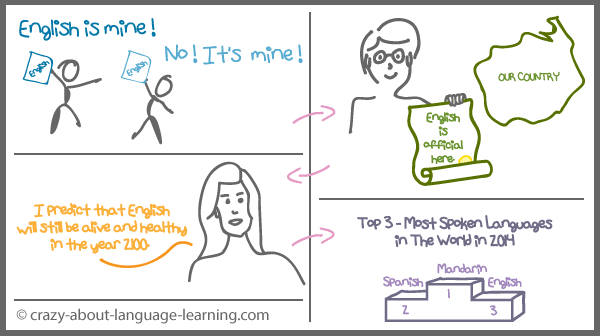 Nowadays – that is, in December 2014 – Chinese Mandarin is spoken by almost one billion people while Spanish is spoken by less than half this number of people. English comes third with about three hundred sixty million native speakers, followed closely by Hindi and Arabic. Then come Portuguese, Bengali, Russian, Japanese and Punjabi. All other languages of the world are spoken by less than one hundred million native speakers; some are spoken by less than a dozen. In fact, only a friend of yours and yourself, a little time and a little commitment are needed to create a new language. 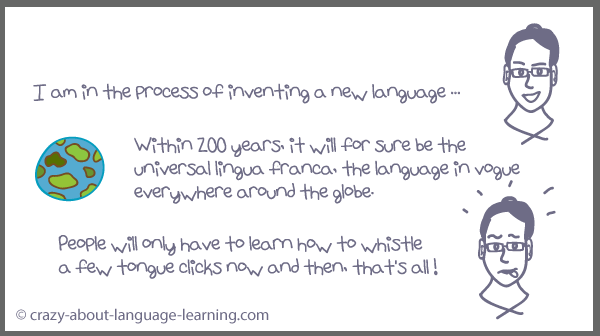 And you can go even further: you can create a language all by yourself. Then, this new language would be called a constructed one though; it wouldn’t be a natural one, sprung from human interaction. But that would still be quite OK. Esperanto and Klingon are such constructed tongues, the first one invented in the hope to become a communication harbor for speakers of all around the world, the second for the sake of a few of Star Trek protagonists’ conversation needs. The history of the rapid change of supremacy of one language to another may seem as incredible as the script of a science-fiction series. Only yesterday for example, Akkadian was the lingua franca, the tongue everybody spoke. Today, you would have quite a hard time finding one person able to tell you just one single Akkadian word. Today, English is a global lingua franca and in a near tomorrow, Chinese may well become this foreign language everybody learns at school.